Humans and Neanderthals lived side-by-side for 5,000 years. We share DNA. Do the maths. We (humans) eventually “outcompeted” them though. Go us. HUMANS AND NEANDERTHALS may have coexisted in Europe for more than 5,000 years, providing ample time for the two species to meet and mix. Using new carbon dating techniques and mathematical models, researchers examined about 200 samples found at 40 sites from Spain to Russia, according to a study published Wednesday in the journal Nature. They concluded with a high probability that pockets of Neanderthal culture survived until between 41,030 and 39,260 years ago. “We believe we now have the first robust timeline that sheds new light on some of the key questions around the possible interactions between Neanderthals and modern humans,” said Thomas Higham, an archaeologist at the University of Oxford who led the study. 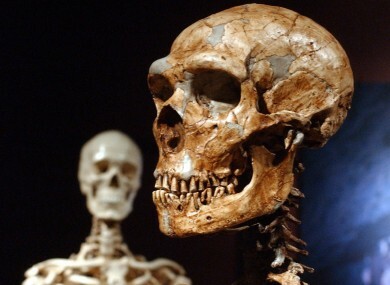 While it’s known that Neanderthal genes have survived in the DNA of many modern humans to this day, suggesting that at least some interbreeding took place, scientists are still unclear about the extent of their contact and the reasons why Neanderthals vanished. “These new results confirm a long-suspected chronological overlap between the last Neanderthals and the first modern humans in Europe,” said Jean-Jacques Hublin, director of the Max Planck Institute for Evolutionary Anthropology in Leipzig, Germany, who wasn’t involved in the study. “What we don’t see is that there is spatial overlap (in where they settled),” said Higham. This is puzzling, because there is evidence that late-stage Neanderthals were culturally influenced by modern humans. Samples taken from some Neanderthal sites include artefacts that look like those introduced to Europe by humans migrating from Africa. This would point to the possibility that Neanderthals, whose name derives from a valley in western Germany, adopted certain human habits and technologies even as they were being gradually pushed out of their territory. “I think they were eventually outcompeted,” said Higham. Email “Humans and Neanderthals lived side-by-side for 5,000 years. We share DNA. Do the maths. ”. Feedback on “Humans and Neanderthals lived side-by-side for 5,000 years. We share DNA. Do the maths. ”.